A very big thank you to the sponsors and Prize Donors for the tourney. Please see: Sponsors, Prizes Links and Prizes Contacts listed on the left below. This tourney was a success in large part due to you. THANK YOU! Thank you to everyone who fished the 1st Annual Outdoors 101 Project Mixed Couples Walleye Tourney. From what we heard, everyone had a good time in spite of the fishing being pretty tough. Jeff Mistelski and Shawn Campbell won: 1st place ($500), 1st calcutta ($504) and biggest fish ($120). Congratulations. Click here to see the complete tourney results. Through the entry fees/calcutta/prizes/and matching funds project from Modern Woodmen, the tourney generated $2222 for Outdoors 101 Project. The $$ will be used to purchase fishing equipment for kids/parents who attend Fishing 101 classes together. For info on Outdoors 101 Project click here. 24 teams have entered for the 1st Mobridge Mixed Couples Walleye Tournament. Teams from Rapid City to Bismarck to Sioux Falls have signed up - "Thank you". In addition, we're giving out 25+ prizes valued at over $2,200 dollars. The Mobridge Mixed Couples Walleye Tournament is a fundraiser for Outdoors 101 Project. Outdoors 101 Project is an effort to get area youth and their parents introduced to outdoor activities by showing them what each activity involves and giving them the equipment to get started. 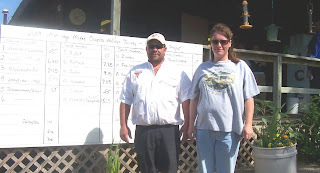 We held a "Fishing 101" in May, 2009, with plans for others next year in Winner, Mitchell, Aberdeen, Mobridge, Gillette WY and possibly others. We're also hoping to expand to other activities such as archery, trapshooting....activities to get families together. "Outdoors 101 Project" - Promoting education and excitement about the great outdoors! Includes: entry fee and for each fisherman - buffet supper, 1 drink and 5 tickets for prize drawings. Rules Meeting and Calcutta: Moose Lodge - Social begins at 5 pm, buffet supper at 6 pm, followed by rules meeting and calcutta - July 31. Buffet Supper: Supper to include 3 piece deep fried chicken, mashed potatoes w/ gravy, corn, biscuit and tossed salad. Launch: All boats will launch from Indian Creek Recreation Area at 7:30 am. There will be a boat check prior to launch beginning at 6:30. Weigh-In Location: All boats must bring their fish by boat into the Indian Creek Marina by 3:30 pm. You are not to trailer your fish; they must be boated. The scale will be located at the bait shop in the camp ground. Boats can be loaded after dropping off your fish (one angler must be remain with the fish). Weigh-In: Each team may weigh 6 fish, with 2 being over 20". The "Golden Rule" will be used as the official ruler. If 3 or more fish over 20" are brought to the scale, that team will be disqualified for breaking SD state law. In the event of a tie, the prize winner will be the team who signed up for the tourney first. State Rules: All SD GF&P rules apply to fishing and this tourney. Bad Weather: In the event of bad weather, the tourney will take place on Aug. 2, 2009. Prizes: There will be a Chinese Auction for the prizes. They will be given out after the calcutta, Friday evening. Every fisherman will get 5 tickets. More can be purchased for 5 for $5 or 15 for $10. Payouts: Payouts for placing and calcutta will be given out after the weigh-in on Saturday afternoon at Indian Creek Marina. These payouts are based on a full 50 team tournament. If the tourney doesn't fill, there will be one paid place for every five teams entered. Calcutta Pay-out: We are paying back 80% and five places. Largest Walleye: If the largest walleye is over 8#, it will be mounted for you - courtesy of Kevin Schlepp, Prairie Outpost Taxidermy. Everyone fishing the tourney will get 5 tickets. You'll have the option of purchasing more - 5 for $5 or 15 for $10. The following local businesses, agencies and people have contributed to this tourney. "I am so glad you received the Shop Vac. Hopefully you can raise alot of money with it. I love your fishing outing that you are doing for kids. Its so nice when someone organizes something so great. The kids will remember an event like this forever! Please contact us next year and we can get you another donation!"